The end of our journey returns us to the beginning, and the reason for writing this story in the first place. 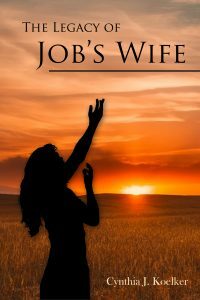 For some reason I became troubled by how so many preachers depict Job’s wife in their sermons – as a bitter, selfish woman, unsupportive of her suffering husband. It just didn’t jive with the women I’ve known who’ve experienced the loss of a child or other life-shattering event. It allows no room for deep grieving, or even depression. It offers no forgiveness for words or actions when one’s soul has been crushed. Over my decades as a physician I’ve become convinced that the most important thing I can offer hurting people is hope – hope for wellness, hope for happiness, hope for wholeness. Surely that’s in line with what God wants for us – to see and know His love, even when living seems impossible. How will you remember Job’s wife, now that you’ve come to the end of her tale? What is your response to God amid the suffering you’ve encountered in your own life? Has this book helped you find meaning in your problems, great or small? Are you at peace with the problem of evil in this world? In her own words, Ix’ises finally answers this question, as her final days draw to a close . . .
Curse God and die, words of one who knew too little of life or love to see beyond her pain. Yes, it was a difficult lesson, a dreadful lesson, one that could not be learned in a day. But God gave me a lifetime, two lifetimes, to understand. At my age I expect I’ve learned all I can from what happened so long ago, only yesterday.